I am frequently asked by folk which is my favourite topic/subject for photographing. There is no straight answer to this BUT…I do love shooting waterfalls. Always have, always will. Now, there are two fairly powerful and differing schools of thought about these. To photograph them in a blur, or to capture every splash and drop? I have always maintained that this is the choice of the photographer; neither is right and neither is wrong. If I am judging a shot there is NO WAY I would judge it down purely on the basis of my preference. A well composed, technically sound shot will stand up on its own. But it has been interesting over the years to listen to comments such as “blurred waterfalls – that’s not natural”. or “too frozen looks wrong. That’s not how the eye sees it”. To me, both of these comments are a bit daft. 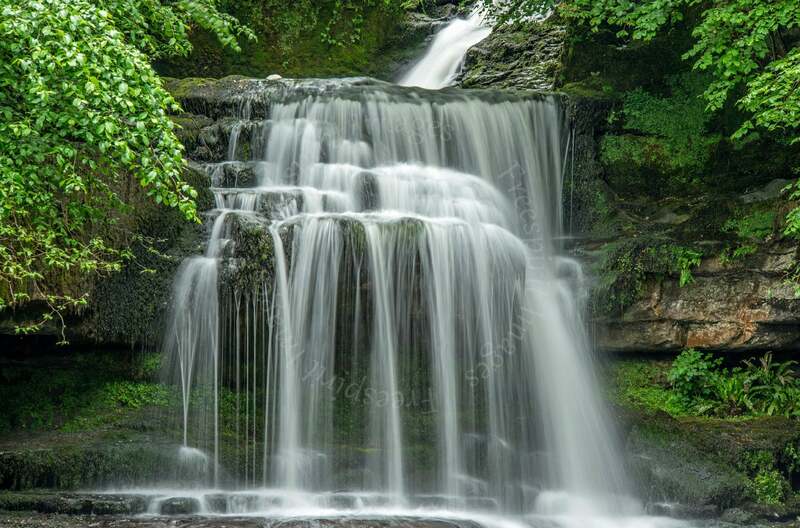 First of all, because the camera/lens combination are able to capture water through a high or low shutter speed to me makes it no more or less natural than the shortfall in our eye/brain connection that does not allow us to see waterfalls this way. Moving water, over time, will appear blurred. Moving water, in a split nano second, will appear static – that’s how it is! OK, my preference – is to shoot the falls with a degree of blur to show movement. This to me renders the story, if you like, behind flowing water. Water is NOT static, it flows, sometimes quickly, sometimes slowly. But it always moves (unless it is a block of ice – when it would have to be carried, thrown or whatever). Sure, I do believe it is possible to take a BAD waterfall shot; for example, too long an exposure leaving the image looking like pouring double cream. To avoid this I generally take a reading off the plunge pool, the whitest part of the photo, as work around that. My target finish is to achieve an effect like ‘spun glass’ where the strands of water are still visible and not mashed into a whiteout. Notice that I also consider which orientation is best; landscape or portrait. which may be of interest? In the meantime I would love to hear how and why you photograph waterfalls the way you do. « Autumn Tints – do we need sunshine and blue skies? 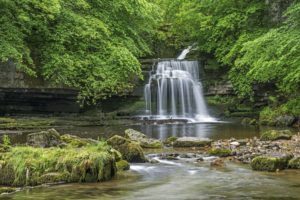 Great blog Nick – I too, love taking waterfalls! I never know what ‘look’ is going to turn best so I like to experiment with shutter speeds. Lovely waterfall pics above btw. 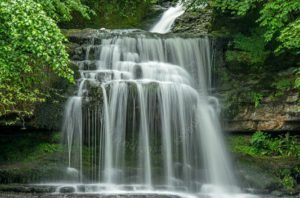 Great blog Nick – I too, love taking waterfalls! I never know what ‘look’ is going to turn out best so I like to experiment with shutter speeds. Lovely waterfall pics above btw. 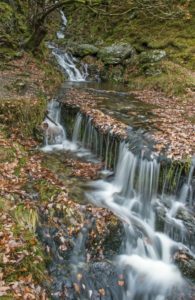 great info, i have very little experience at shooting waterfalls, love your images, and hopefully we can get together early next year. Definitely Derek, I have some in mind! Can always take one with a slow shutter speed giving the blur effect and another freezing everything and see what you prefer. Of course – the only way really to discover what You, the photographer, prefer. My preference is somewhere between frozen and milky; I find shutter speeds of the order of 1/8 second do a reasonable job. I guess it depends on the “speed” of the water, but it seems a reasonable guide. In my case, I don’t get to chimp the results, as I won’t see them until developed and scanned! Earlier in the year I was lucky enough to spend some time in the Smoky Mountains (Tennessee) where there are LOTS of waterfalls and rock-strewn streams. I confess to adopting ‘creamy’ mode for all but a few of my images as the almost constant woodland setting and soft lighting seemed to fit better with that than with ‘harsh’ water droplets. 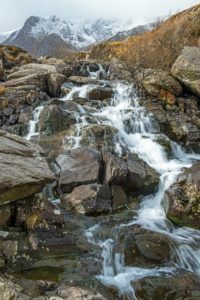 Having said that I agree that having too creamy an effect can look a bit stupid for waterfalls where a sense of movement is required. Something mush, such as we often see with long exposure seascapes, simply wouldn’t work IMHO. I tend to agree Richard – thanks for the comment! Smoky Mountains? Lucky you. They were written about and beloved by Bill Bryson! (A Walk in the Woods). wonderful sight and beautifully photographed Nick.I just love the picture on the cover of your book too, it has quite a ‘dreamy’ effect – it is super. I also use a shutter speed of about 8th sec for water, I found 15 secs, which most people seem to use, not quite slow enough, I know it does depend on the light. You don’t seem to need sunlight either, a cloudy day seems so much better. I was looking at someones image of the West Burton Falls last week and thinking what a beautiful Falls it was and such a beautiful setting, I had no idea it was in Yorkshire I thought it was in Wales! Hi Barbara – yes, it is behind the village of West Burton (oddly enough!) – a small village near Aysgarth in Wensleydale. I agree that an overcast day is best as it tends to slow shutter speeds down anyway without necessarily needing to resort to filters and ALL my waterfall shots are in this light, never blue skies and sunshine. 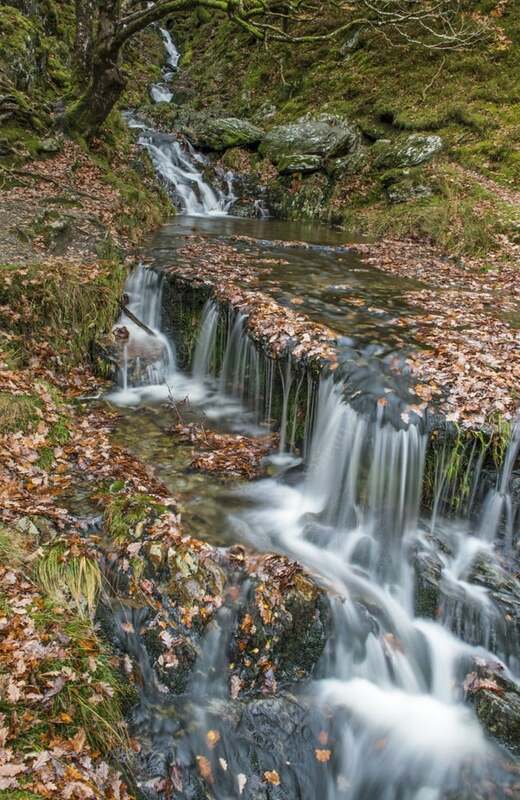 ich sehe erst jetzt deine Fotos,…die sind wunderschööön,…ich liebe Wasserfälle, und deine Bilder sind einfach außergewöhnlich ! ich bin froh, dich als Fotograf zu kennen !